We plan to spend a lot of time in our living room, which is adjacent to the kitchen and dining room. This room is quite odd to decorate, as there are only three walls, and then a fireplace, which makes up a half wall, and then opens into the kitchen & dining area. One of the walls is an 8'6" slider, that opens to our three season porch, one wall is a large stacked brick wall, which was one of the selling features for us, and the third wall is 12' of floor-to-ceiling windows and a wee bit of wall space on one side. Needless to say, our furniture will be floating in the center of the room, as I don't like it up against any of our "walls". A bit of inspiration above - love the large windows, low furniture, mix of wood, fabric sofas, and awesome fireplace. Also, the low-hanging lights catch my eye, although I'm not certain we're going to pull that aspect off. And here is where we are so far....this room is very much a slow process. The upper left photo is actually the brick wall in the room. It's giant, and we love it, and NO, we are not painting it. Actually, it cracks me up when people ask this. I think it's amazing, but people assume we would want to paint it white. 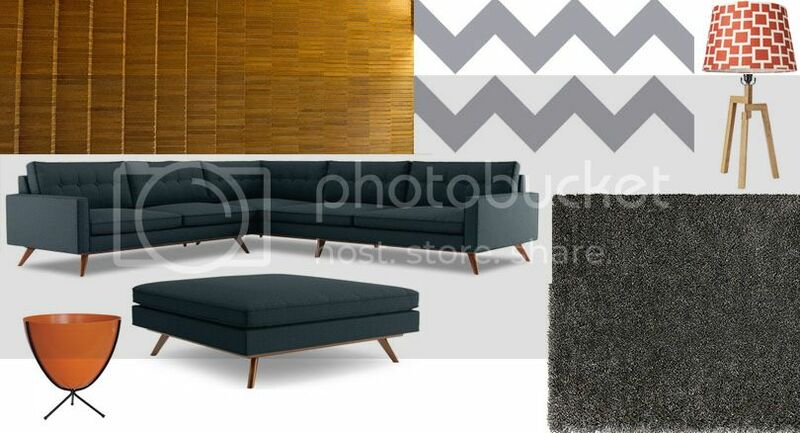 The image of the sofa & ottoman is correct - we ordered this from Thrive Furniture on Black Friday for a killer deal. It's proper name is "Azure" and we LOVE it! Sort of like a navy-teal, and it's perfect with the orange-y brick wall! It's currently sitting in the living room, wrapped in plastic, under layers of dust. Not ideal, but it's huge and we have no where else to put it right now! The chevron stripe represents the fabric I think I want to use for our windows. We have a 12' long window that looks out the front of the house, and a 8'6" slide that looks out the back into our three season room. We have found some brackets at IKEA that support a sliding system, so as long as I can find fabric that I absolutely love, I'm going to have curtain panels made for this room. I'm still LOVING chevron, but am open to other graphic patterns as well. With the grout in the brick wall being gray, I am working the gray into this room in the form of curtains, the rug, and the paint. We have scored a bullet planter, but it needs to be painted right now. And the lampshades on the right are from Target and they are perfect. Still haven't decided on the lampbase, but leaning towards a wood base, since I'd like to work more wood into this room. And the TV? Well, we are not exactly sure where that is going right now. Lots of design decisions to be made in this room yet. *Love* the sofa. Coincidentally I had was just looking at the Thrive website the other day; so many great sofas to choose from! I'm thinking of the "Cleveland" for our rec room. I have a gray chevron home decor weight fabric at home right now, remind me to show it to you on Monday, I love it!